Great Teacher Onizuka is the story of Eikichi Onizuka, an unorthodox high school teacher whose decidedly unusual teaching methods make him a hero to the kids, but a menace to the establishment. Conceived as a Japanese manga by Toru Fujisawa, the saga of Great Teacher Onizuka achieved phenomenal success in Japan, spawning an animated television series, a twelve-episode TV drama, and a TV special. 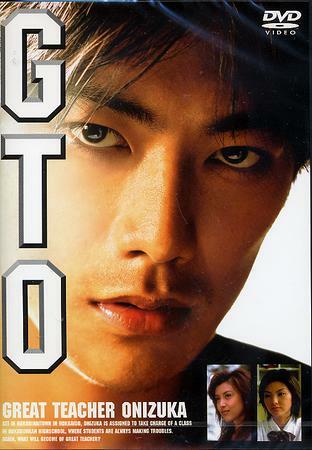 Finally, in late 1999, the braintrust of Fuji TV brought us GTO: The Movie, which is what this review happens to be about. Unlike the usual GTO storylines, the film takes place as far away from the big city as possible. The setting is the rural town of Horobonai, which is located on Japan's northern-most island of Hokkaido. The local high school has a trouble class, which is mostly due to the presence of Ayano Katsuragi (Rena Tanaka), the local ice princess, whose dad ran a theme park called "Canada Land." Unfortunately, said park went bankrupt and the town is now experiencing a depression, of both the economic and emotional variety. The kids (including Ayano) frequently threaten suicide, and the teachers are your usual motley band of useless types. Enter new substitute teacher Onizuka (Takashi Sorimachi, returning from the TV series), who rides into town on his motorbike. Within minutes, he bullies a couple of kids, insults most of the teachers, and generally acts disrespectful and obnoxious. Things are the worst for Raku (Hideyuki Kasahara), a mousy kid who has no friends and contemplates suicide of his own. Onizuka steals money from the kid, accidentally pushes him off a roof (don't worry, he survives), and even badgers Raku into giving him room and board. Still, it's all good. Onizuka may seem like your bargain-basement thug (the character was previously in a biker gang), but this is all standard operating procedure for "Great Teacher Onizuka." The popularity of the character is well-documented and actually easily understood. Onizuka may be a societal castoff (he attended a fourth-rate college and is actually dumber than most of his students), but his brash, honest and utterly righteous ways make him a hip youth icon for our troubled times. Considering that Japan's educational system is polluted with corruption, abuse and student-teacher improprieties, Onizuka makes a decidedly refreshing anti-hero. Malcolm Short Jul 25 2016 3:14 pm Rena Tanaka plays Ayano Katsuragi, not Norika Fujiwara (who plays Kaoru). You credit Norika Fujiwara with playing both roles! Also, Keiko Toda and Toshihito Itô have roles as teachers in the movie.